"You don't read the book, the book reads you." 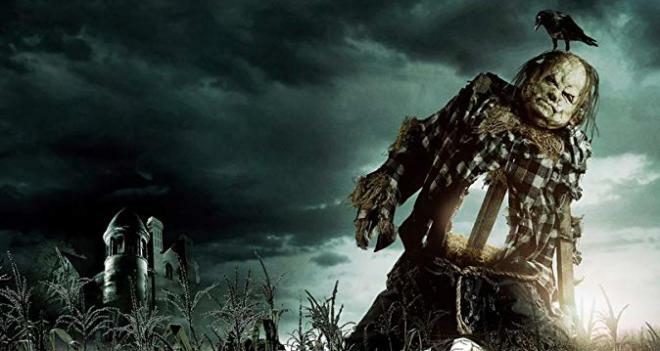 CBS Films has released the a new teaser trailer for Scary Stories to Tell in the Dark. The film is based on the children's horror book series of the same name, and is set to hit theaters on August 9. It’s 1968 in America. Change is blowing in the wind...but seemingly far removed from the unrest in the cities is the small town of Mill Valley where for generations, the shadow of the Bellows family has loomed large. It is in their mansion on the edge of town that Sarah, a young girl with horrible secrets, turned her tortured life into a series of scary stories, written in a book that has transcended time—stories that have a way of becoming all too real for a group of teenagers who discover Sarah’s terrifying home. Scary Stories to Tell in the Dark stars Zoe Margaret Colletti, Michael Garza, Austin Zajur, Gabriel Rush, and Dean Norris. The film is directed by André Øvredal (Trollhunter) and comes from a script written by Dan Hageman, Kevin Hageman, John August, Guillermo del Toro, Marcus Dunstan, and Patrick Melton. In addition, Guillermo del Toro also serves as a producer, along with Jason F. Brown, J. Miles Dale, Sean Daniel, and Elizabeth Grave. Meanwhile, Roberto Grande and Joshua Long are on board as executive producers. The original Scary Stories to Tell in the Dark book was written by Alvin Schwartz and illustrated by Stephen Gammell. The book was first published in 1981 and was followed by More Scary Stories to Tell in the Dark in 1984 and Scary Stories 3: More Tales to Chill Your Bones in 1991.